Built in 1926, the 125-foot-tall Astoria Column sits atop Coxcomb Hill, some 600 feet above the mouth of the Columbia River in Astoria, Oregon. A 164 step spiral staircase leads to the observation deck at the top and the stunning view. From here the visitor can gaze out on a broad expanse of the Pacific Ocean to the west, the mighty Columbia River to the north, Mt Rainier and the Cascade mountains to the east and the beautiful port of Astoria below. On the outside of the column a spiral frieze of over 500 feet long shows 14 major events in the early history of Oregon with a focus on the history of Astoria, Captain Gray’s discovery of the Columbia River in 1792 and the Lewis & Clark Expedition. 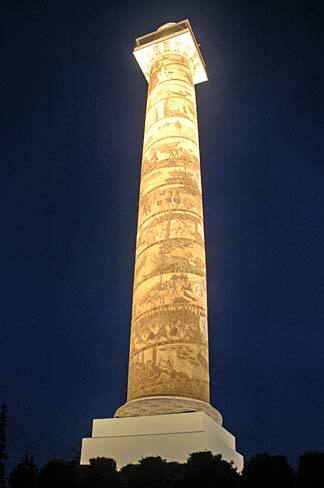 In 1974 the column was listed in the National Register of Historic Places.